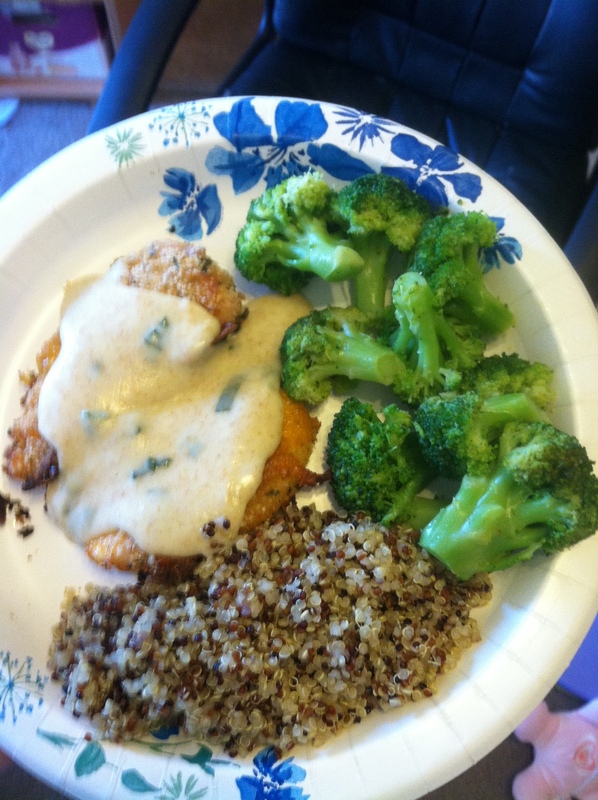 Served with quinoa cooked in chicken broth, and broccoli sautéed in butter and lemon. There was a recipe that was posted on Facebook earlier that looked really good. It was a cheese crusted chicken recipe which used mostly natural ingredients, except for two: Ritz crackers (breading) and Campbell’s cream of chicken soup (sauce). Two of my favorite foods, chicken and cheese. What sort of deliciousness was this? While I would have just followed the recipe if I were still eating a crap-filled diet, I decided that I couldn’t just pass it by because there were two bad ingredients. I decided to make my own version. Totally clean. Totally delicious results! Preheat oven to 400 degrees F. Grease a 9×13 baking dish with olive oil until bottom is entirely coated (I do this with a dry paper towel). Put milk, cheese, and breadcrumbs into three separate dishes. Dip the chicken into the milk, press chicken into the cheese on both sides, then coat with breadcrumbs. Repeat until all chicken pieces are covered. Set chicken in greased baking dish, cover with foil, and put into the oven. Bake for 35 minutes covered. Take dish out, take foil off, and put baking dish back into the oven for an additional 10 minutes to brown. Meanwhile, melt butter over low heat in a medium saucepan. Once butter is completely melted, whisk in whole wheat flour until completely mixed (this is called a roux, and is the basis for most white sauces. Congrats on learning a new technique!). Whisk mixture for an additional two-three minutes over medium heat to cook off excess flour taste. Whisk in milk, and continue to whisk until bubbling. Pour in cheese and whisk until completely melted. Season with salt, pepper, garlic powder, and onion powder. Turn off heat and add chopped basil. Serve over top of chicken and enjoy!